The QEXAFS-monochromator allows to measure an EXAFS-scan in 50ms. 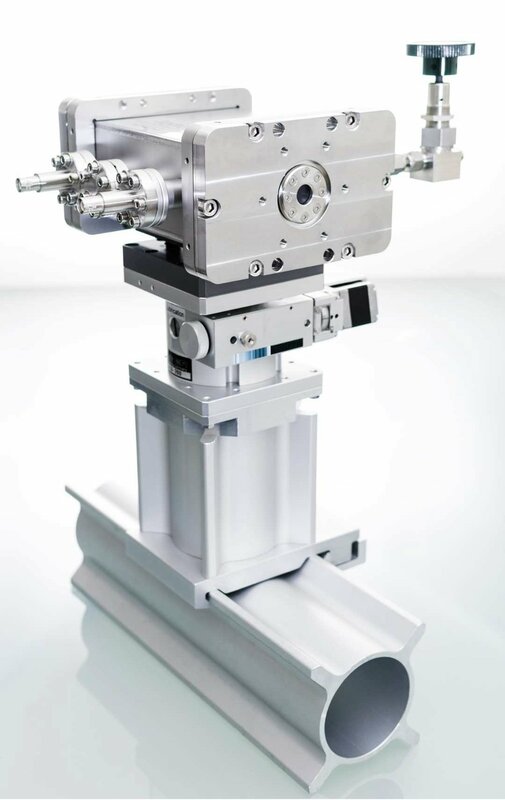 The monochromator oscillates while the intensity in ion-chambers and total-fluorescence yield detectors is measured with fast and high-resolution analog-to-digital converters. Special ion-chambers were designed for these fast measurements. Normal ion-chambers suffer from the slow velocity of the heavy ions, while the lighter electrons are collected quickly. Therefore, a Frisch-Grid was installed in these ion-chambers, which collect the heavy ions and separate their signal from that of the lighter and quicker electrons. The entire QEXAFS-system (monochromator, ion-chambers, fast amplifiers) were designed and built by the group of Ronald Frahm at the University of Wuppertal. Please contact Prof. Dr. Ronald Frahm or Dr. Benjamin Bornmann before submitting a proposal for the QEXAFS-Monochromator. 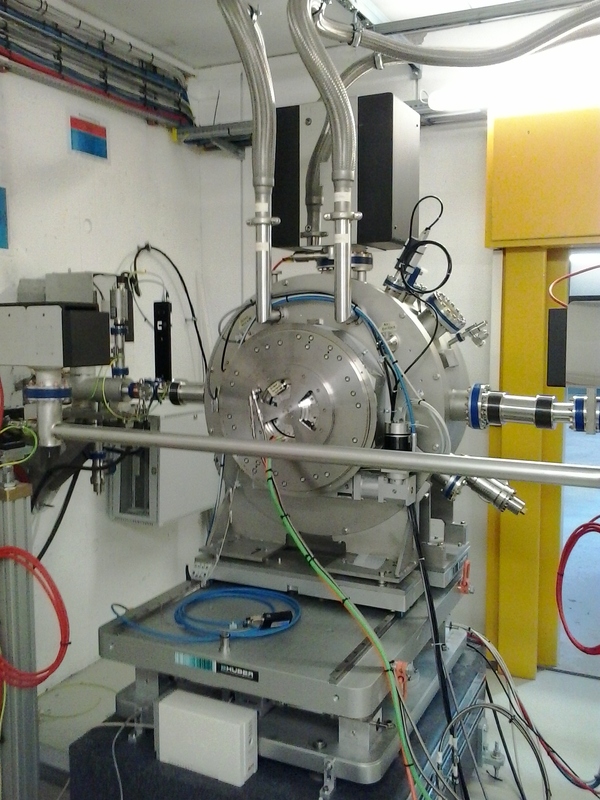 QEXAFS-Monochromator at P64. The Bragg-angle of the monochromator is rotated with a conventional Huber goniometer to the energy of the element of interest. A fast, direct-drive motor, which is installed inside the Huber goniometer, oscillates the Bragg-angle of the monochromator with a frequency of up to 20Hz. Newly developed ion-chamber for QEXAFS-measurements. In addition to the conventional parallel plates, these ion-chambers have a grid, which removes the response of the rather slow ions. Since the position of the beam within the ion-chamber is crucial for the signal, the height each ion-chamber can be adjusted with high precision. The ion-chambers can be filled with different gases and gas mixtures up to pressures of 250kPa. 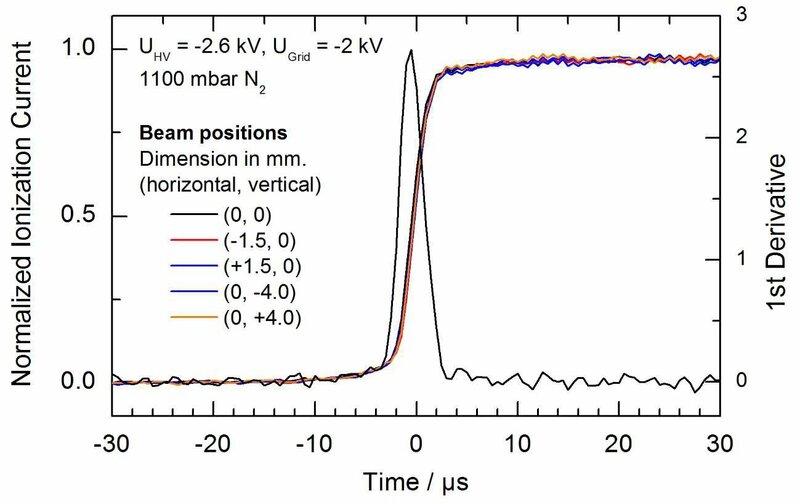 Measurements of the step response function of the gridded ionization chamber at different beam positions within its aperture, and the first derivative. The rise time of this detector system is measured to be less than 4 μs. This is an increase of typically two orders of magnitude as compared to conventional systems. reducing/oxidizing cycles (right) of a Pt based catalyst. Data courtesy by Andreas Gänzler (KIT).